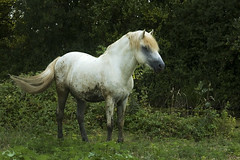 A white stallion from Camargue. The Camargue region is famous for its white horses. The horses are born dark, but get lighter with age, until they become pale gray or white. Silver Stripe website is up!